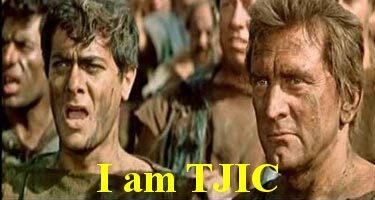 I am TJIC | Curses! Foiled Again! Linoge (Walls of the City) has more on the situation with TJIC, including a quote of the original post behind the loss of his First and Second Amendment Rights recovered from a Bing cache (remember, the internet is forever). http://gatewaypundit.rightnetwork.com/20…U.S. Rep. Gabrielle Giffords of Arizona was shot in the head outside a grocery store in Tucson while holding a public event, Arizona Public Media reported Saturday. Giffords was talking to a couple when the suspect ran up firing indiscriminately and then ran off, Michaels said. It is absolutely, absolutely unacceptable to shoot “indiscriminately”. Target only politicians and their staff, and leave regular citizens alone. As I pointed out before, this post and its title are akin to someone telling the old joke of “What do you call 100 dead lawyers? A good start” immediately after the shooting of a local attorney. Tasteless, considering the events that prompted it, but neither a genuine threat nor illegal – and absolutely protected free speech under the First Amendment. Go, read, check out the others he links to, and above all, think. We should all be very concerned about this abomination of government. Update: Borepatch has a list of people across the web who have linked or commented on TJIC’s plight. Go check it out. Blogger TJIC, who lives in Massachusetts, has fallen victim to the consequences of MA’s “may-issue” firearms licensing scheme, and has had to turn in all his firearms. Remember, this is Massachusetts. The issuance and revocation of the license is entirely up to the discretion of the local police chief. He has the power to revoke a gun owner’s license with no more reason than “I felt like it.” If you police chief retires, the new chief can revoke every license in his jurisdiction simply because he’s anti-gun – like what happened with concealed carry permits in a county in California a couple of years ago, when a new Sheriff was elected and decided the previous Sheriff had been too willing to issue carry permits. Corcoran, who has no criminal history, has not been arrested and does not face any charges. His Second Amendment Right has been suspended with no due process, and for an act that did not break any laws. What other Constitutionally guaranteed Right is this allowed for? The blog post in question was clearly, when taken in context, not intended as a threat. It was not a clear and specific threat that was sufficient to be taken as a criminal act, or else he would have been arrested and charged with a crime. In point of fact, this was a statement similar to the old joke of “What do you call 100 dead lawyers? A good start.” Tasteless, considering the events that prompted it, but neither a threat nor illegal. This is pure, blatant retaliation against TJIC for using his First Amendment Rights to spread a message which is, I’m sure (since it’s in MA), something the local police chief disagrees with. The post in question brought his blog to the chief’s attention, and/or it gave the chief what he decided was a good excuse to revoke his license. This abuse of power to stifle free speech should chill every American to the bone. TJIC has commented at Borepatch’s blog, and indicated that he’s “paying through the nose for a high priced attorney, to fight this nonsense.” If he sets up a legal defense fund for donations, and I find out about it, I’ll post a link. Hopefully, he can get one set up soon. It would be really great if this is the fight that tears down MA’s “may-issue” system in favour of “shall-issue” or (ideally) “no license to required own”, and I hope his lawyer aims for that, but I think everyone will be satisfied with simply getting TJIC his license and his guns back.